This tureen comprises a bowl, and a domed cover topped by a finial knob. It is decorated with bands of geometric designs in black, blue, green, cream and yellow glaze. The interior has a plain cream glaze. The cover and bowl fit together tightly. Tureens such as these originally were used for churning milk – their traditional name jobbana comes from jobna or cheese (Boele et al, 2005), p. 175). Later they became used for serving soup and most particularly harira, a Moroccan lentil soup. 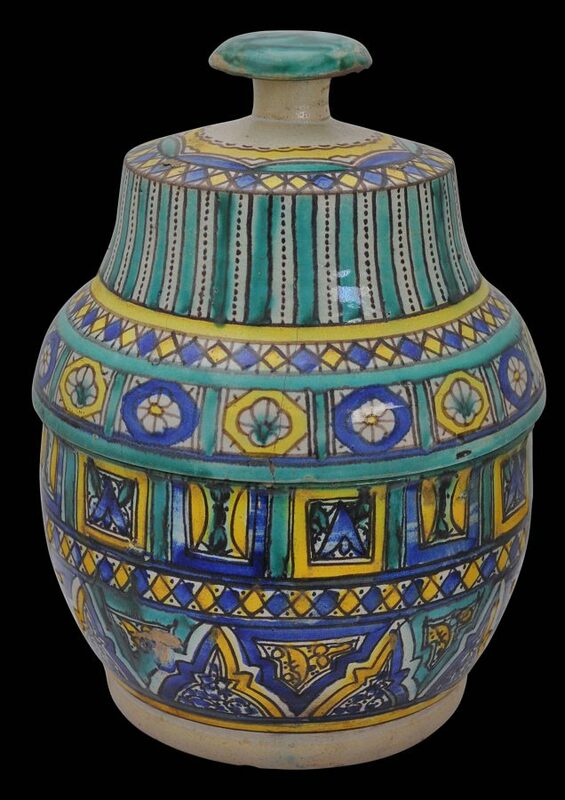 Such a large vessel would have been used at major feasts and celebrations such as a wedding, or during Ramadan in the evenings when the fast is broken by the family and guests. It would have been heaped with couscous and meats from which the participants would have been served. 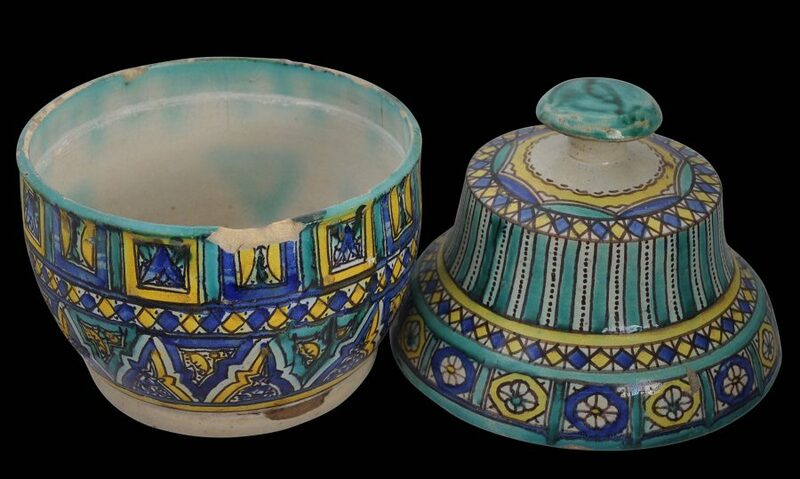 Ceramics in Morocco were typically made by men using a potter’s wheel. They tend to be decorated with abstract geometric motifs in bright polychrome enamels, and seem to show Portuguese or perhaps Italian influence as well as adhering to more Islamic principles of decoration. 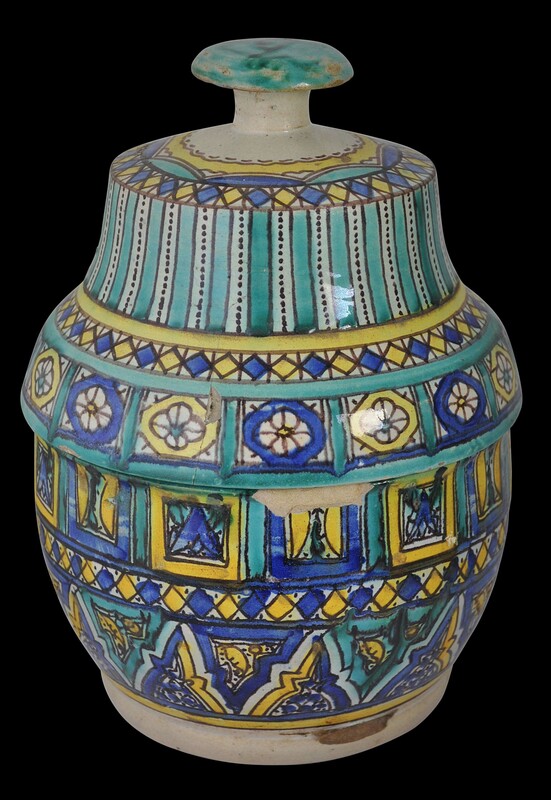 The form and motifs used here is typical of Fes work. 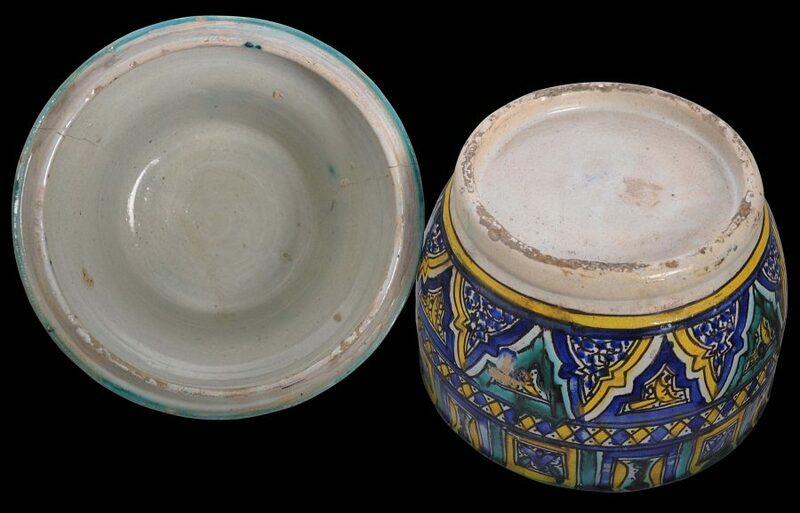 In common with many (and probably most) Moroccan ceramics from the 19th century, the tureen has plenty of signs of use. There are hairline cracks and chips to the rim of the bowl. There are no restorations. Boele, V. (ed. ), Morocco: 5000 Years of Culture, Kit Publishers/Lund Humphries, 2005. Mourad, K., F. Ramirez & C. Rolot, Arts et Traditions du Maroc, ACR Edition, 1998.